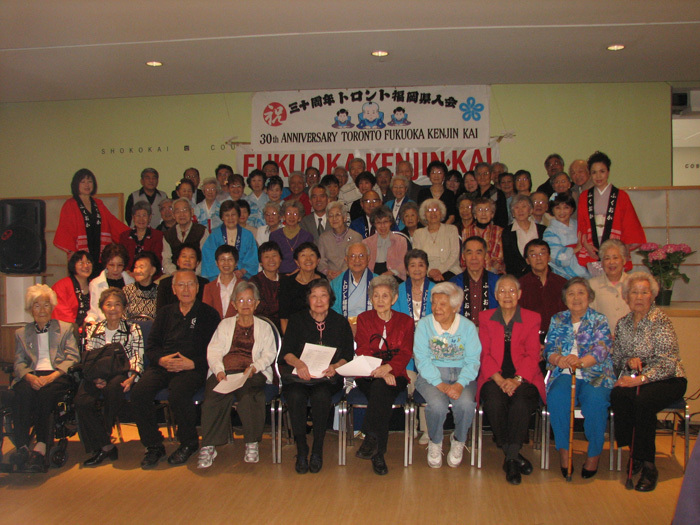 The 30th anniversary of the Toronto Fukuoka Kenjinkai was celebrated in 2010. We celebrated our 35th anniversary this year. The slideshow video shown at the 30th anniversary Social and AGM has been uploaded to YouTube. There are two parts to the video and it shows the activities of the Toronto Fukuoka Kenjinkai over the years. It also includes photos from the 5th Worldwide Fukuoka Kenjinaki Convention held in Toronto in 2004 and the 6th one in Seattle in 2007. Many of the people in the older photos have passed away so this is a good opportunity to remember our former members and the good times they had at our Kenjinkai gatherings. This was the memorial photo taken at the 30th anniversary gathering.